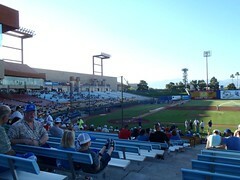 Dad and I went to a game at Cashman Stadium since we were in Las Vegas for a bowling tournament and the Las Vegas 51s were in town on June 16, 2012. 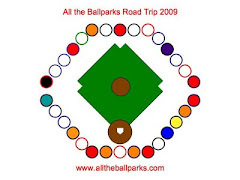 Now that we are all up-to-date and will be for at least the foreseeable future on MLB ballparks we are going to start trying to hit Triple-A ballparks. Not really going to try to hit them all anytime soon, but we are going to try to work them in when we can, which really means when we are traveling without Mik, since he is done with any baseball besides his Dbacks for now. 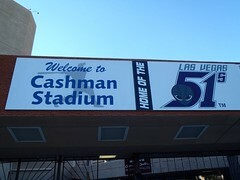 Cashman Stadium is an interesting one with it being quite multipurpose like a lot of stuff in Vegas. 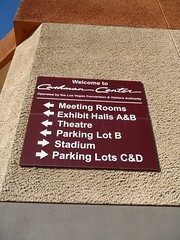 They have a theater and a conference center on one side of it, so it was kind of odd to park on the theater side of the ballpark and it not even looking like you are at a ballpark. We opted for the cheapest seats, which is called the reserved section, but is basically bleacher seating on the baselines. It was hot (not much different than a Tucson Padres game, though) and the plaza seating for a few bucks more looks tempting with its shade and misters. However, it is all behind the home plate netting, which I hate, so kind of a toss up if it would have really been better, except that it would have been because the reserved bleacher seating was extremely uncomfortable and usually I like bleacher seats. Overall Cashman Stadium was kind of a bore. Yeah, I do not expect much from a Triple-A park, but there was not much to like, especially with the game being mostly a lot of walks, hit-by-pitch, and just dumb luck that anyone was scoring. The food selection was also pretty disappointing, as it was mostly hot dogs, although they had quite a few different preparation styles. 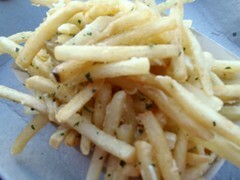 The garlic fries sounded good, but ended up very oily and not really garlicy. However, they did have Ben & Jerry's and Dippin' Dots, which is nice for hot games. If your into alcohol at a ballgame, though, they do have a full bar. Better yet, they totally do cutoff people they think are getting drunk, although that led to the guy next to us being a totally jerk for an inning before he finally decided to just leave. 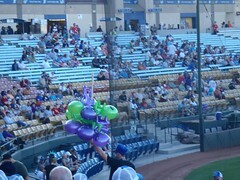 I guess the only really interesting thing about the ballpark is that they sell inflatable aliens. My boyfriend and I recently decided to do this, and I'm so glad I found your blog! I bookmarked it on my browser so I have it to look back on whenever we visit a particular ballpark. Nice job!